The mission of T&B Foundation, Inc. is to encourage and support families with minor children battling cancer. We do this by providing Patient Pouches to the children with activities and diversions while awaiting and undergoing cancer treatment.While Patient Pouches is our first venture, we hope to expand and find other ways to help support and encourage families as they face this horrible disease. The purpose of the Corporation is to encourage and support families with minor children battling cancer, to solicit support of the Corporation’s activities from public or private sources, and to receive, administer, and raise funds for furthering the goals of the Corporation. The Corporation’s purpose includes but is not limited to providing children with activities and diversions whileawaiting and undergoing cancer treatment. Lindsey and her husband Bill live in Maple Shade, NJ right outside Philadelphia with their two (soon to be three) children, Madison (4) and Tyler (3). Lindsey has her Bachelor’s degree in Business Management with a concentration in Hospitality and Tourism Management from Strayer University. Right now Lindsey is enjoying the job of being a stay at home mom with her kids. In February 2011, when Tyler was 2 months old he was diagnosed with bilateral retinoblastoma. Soon after Tyler’s diagnosis Lindsey realized that her way of coping was to give back and raise awareness. Three months after Tyler’s diagnosis, Lindsey and Bill organized their first walk, Tyler’s Troops Walk for Retinoblastoma. 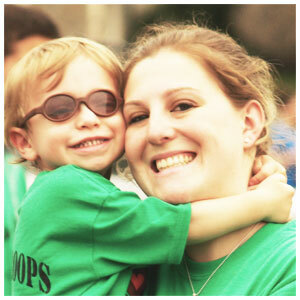 Before forming T&B Foundation, they hosted 3 annual walks and raised over $50,000 for retinoblastoma. After being invited to a Busy Bag Party, Lindsey was doing some research on what busy bag to make. She read that busy bags are good for using at doctor’s appointments to keep children occupied, which started the idea for Patient Pouches. Lindsey contacted Sabra and together they came up with the idea of starting T&B Foundation, Inc. and an idea turned into a reality. The foundation has continued to grow from that point on. Sabra lives in Greenville, SC with her husband of 20 years, Jason and their 3 children. Erika, age 13 is in the 8th grade and plays competitive soccer. Ashley, age 10 is in the 5th grade and is a competitive gymnast. 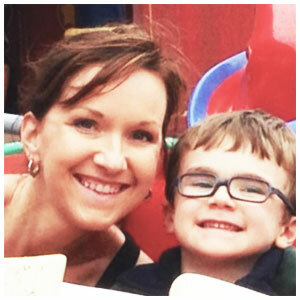 Brayden age 5 is a smart, busy little man with an obsession for trains, cars & planes. In addition to working for T&B Foundation, Inc., Sabra volunteers monthly at the Greenville SC Ronald McDonald House and in the Children’s Ministry at their church. The Bateman family has also organized and participated in multiple fundraisers for Angel Flight East, Alex's Lemonade Stand Foundation, Ronald McDonald House, Daisy’s Eye Cancer Fund, CHOP, Wills Eye Institute and The BiLo Children's Cancer Center in Greenville, SC. After marriage, college and the birth of their first child, the company Sabra works for, Progressive Insurance, relocated the family to Greenville, SC for her to manage the claims office. Jason was diagnosed at 20 months old and because of the size of the tumor and because his RB was unilateral, his left eye was enucleated. Jason has never needed any other treatment in relation to his RB. To know Jason, you wouldn’t know he had one eye. He held school records in high school and college for sports and even went to college on a Soccer scholarship as a goalie of all things! Jason has never let having one eye or being a cancer survivor get in his way of accomplishing his goals. Brayden was diagnosed with Retinoblastoma at 2 weeks old. As Brayden was going through active treatment for bilateral Retinoblastoma, the Bateman family met so many other families just starting down this path. Sabra made a commitment that once Brayden was stable, she would make a difference in the world of Retinoblastoma, specifically around awareness, early detection and encouraging other families going through having a child diagnosed with cancer. They were so blessed to have met amazing families as Brayden was going through treatment. One of these families was the Barnett family. Sabra and Lindsey share a passion for giving back to the families affected by childhood cancer which is how and why T&B Foundation, Inc. was created. Our hope is that you will help T&B Foundation continue to make a difference for kids fighting cancer!